comes to DVD on Oct 22, 2013! When my middle child was 3- or 4-years old, he became fascinated with Transformers! First, it was only BumbleBee, the yellow Transformer, but next came Optimus Prime, the head Transformer. Needless to say, at that stage we had Transformers pjs, shirts, shoes, bedsheets, DVDs, and of course toys! And doesn't it go without saying that we had a Transformers birthday party for him, complete with a themed cake! Those days, I spent hours with my son transforming Optimus Prime (semi-successfully) from truck form, then back to robot form, and then back to truck form again! We had a lot of fun playing Transformers together, but I found that the Transformers movies were too mature for him, although the toys were age-appropriate. 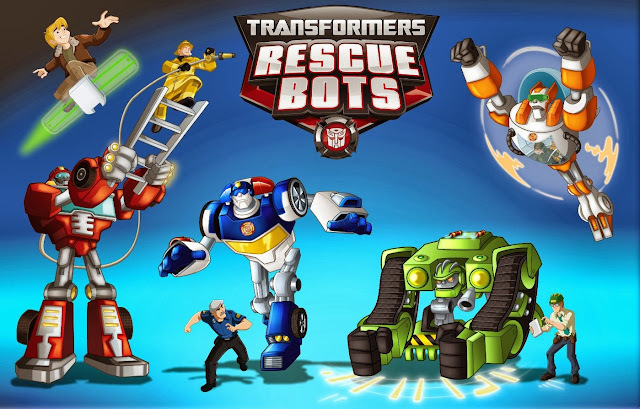 Transformer Rescue Bots Help Humans Rescue People! If you have boys aged 4- to 10-years old who like action shows, I would suggest the Transformers Rescue Bots series. It is definitely a more juvenile version of the Transformers, then the movie format. I would kind of equate the tameness of the series with the Scooby-Doo cartoon, and it also features some funny sight-gags. The Transformer Rescue Bot characters transform from robot to rescue vehicle, to help their human counterparts rescue people! For example, Heatwave transforms into a fire engine, Chase into a police car, Blades a rescue helicopter, and Boulder into a Bulldozer! 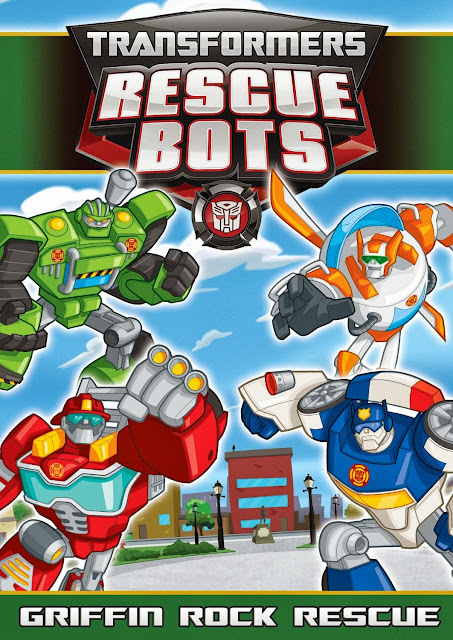 If your child or grand-child loves robots, vehicles, or rescue, then he will enjoy watching Transformers Rescue Bots! Transformers Rescue Bots: Griffin Rock Rescue comes to DVD on October 22nd, 2013! Watch a clip from the Transformers Rescue Bots: Griffin Rock Rescue DVD, below! WIN a copy of Transformers Rescue Bots: Griffin Rock Rescue on DVD! Contest open to Canada & USA, and ends on Tuesday October 15th, 2013. Leave a COMMENT below stating what your child or grandchild is crazy about: (ie: Transformers, robots, cars, trucks, rescue vehicles, etc). Then use the entry form, below, to enter the contest. GOOD LUCK! my son loves transformers especially optimus prime, whereas I really like megatron. GirlFriend!! You really put a lot of work into your reviews!! If you have "Klout" you should be getting 100K everyday for the reviews! Thanks for the nice compliment, CricetJean Gentry! My little guy LOVES transformers and superheros................he can't get enough of either!!!! My nephew loves cars and superheroes. My nephews love transporters and all cars and trucks. My nephews love anything transformers and cars and trucks. My Grand Son loves playing with Transformers. My nephew is crazy about Legos and transformers! My son is crazy about Monster Trucks! When our sons were growing up, transformers were a big deal too. A few months ago, when our youngest was going thru some of his old stuff, he came across them again. So out they came to share with his children. Needless to say, they were a big hit again. Would love to win this for my grandchildren. My little guy loves EVERYTHING transformers!!! seems that I forgot this so here I am now. My grandson is mad about Monster Trucks, he and his dad went to see some and he was over the moon. My Nephews love Star Wars and Lego. My son is nuts about just about anything that has a motor or moves! Big fan of John Deere! Plus trains and monster trucks! any cars or truck ..
My grandson is crazy about Hot Wheels, Dinosaurs, Transformers, Building Blocks like Lego, stuffed animals, computers and numerous other things! My nephew love Thomas the Train! Lego City and Rescue Bots. Only Lego City and Rescue Bots. Lego City and Rescue Bots are the main event at our house. My nephew loves Transformers - especially Optimus Prime and Bumblebee! My nephew loves Transformes - especially Optimus Prime and Bumblebee!